A fracture is a broken bone. A bone may be completely fractured or partially fractured in any number of ways (crosswise, lengthwise, in multiple pieces).Co-management of existing conditions like diabetes becomes critical. Some broken legs are more serious than others it depends on the location of the fracture, how the bone has broken and whether there is any damage to the surrounding tissue. 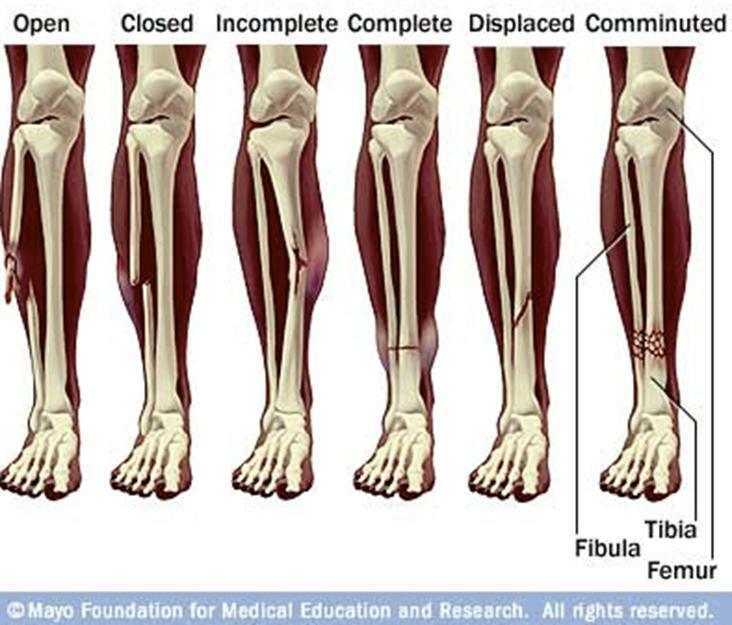 The most common types of fracture are described below. Stress fractures : tiny cracks in the bone caused by overuse of the leg; common in athletes. Undisplaced or hairline fracture :a fracture through the bone with little damage to the surrounding tissue. Displaced fracture : the two parts of the broken bone have moved apart (misaligned). Comminuted fracture :the bone has broken (shattered) into several pieces. Open or compound fracture :a complicated break where the bone has broken through the skin, or the initial injury has exposed the broken bone. Inability to use the limb. - Good first-aid care of fractures is always important. Moving the broken bones can increase pain and bleeding and can damage tissues around the injury. This can lead to complications in the repair and healing of the injury later on. - First aid for fractures is all about immobilizing (limiting movement of) the injured area. Splints can be used for this. Control any external bleeding. - Until the cast has set properly, avoid direct heat such as hot water bottles. Rest the limb as much as possible. - Use the techniques shown to you by nurses to walk or manage day-to-day activities. For example, you risk further injury if you use crutches incorrectly. - Avoid any lifting or driving until the fracture has healed. - If the skin under the cast is itchy, don't poke anything between the cast and your limb (such as a coat hanger or pencil). Instead, use a hairdryer to blow cool air into the cast. - Don' t get your cast wet, as wet plaster becomes soft and does not provide the necessary support. Wet plaster can also irritate your skin. When showering, wrap the cast in a plastic bag and tape it directly to your skin, to keep the area watertight. - See your doctor immediately if you have swelling, blueness or loss of movement of the fingers or toes, pins and needles, numbness or increased pain. Wrongly fitted plaster cast (for example, too tight or too loose). Stunted growth of the bone- if a child's long bone breaks close to the joint where the growth plates are found. Damaged muscle, nerves or blood vessels around the fracture ,this can occur during the initial injury (often caused by a sharp piece of broken bone) or during surgery. This may lead to loss of movement or feeling, or may affect the blood supply to the limb. Acute compartment syndrome -this is a painful and potentially serious condition caused by bleeding or swelling within an enclosed bundle of muscles (a muscle "compartment"). This can occur soon after a fracture, after the plaster cast has been applied or after surgery. Emergency treatment is needed using a surgical procedure called an emergency fasciotomy. The most common way to evaluate a fracture is with x-rays, which provide clear images of bone. X-rays can show whether a bone is intact or broken. They can also show the type of fracture and exactly where it is located within the bone. 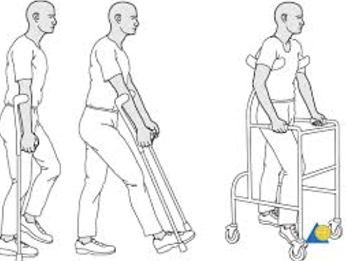 Consultation with rehabilitation specialists can be useful in helping inpatients to ambulate with the aid of crutches or a walker and, ultimately, to decrease postoperative morbidity and expedite patients' discharge planning. Rehabilitation services can be invaluable for many individuals in regaining their ROM and strength once the fracture has healed. More severe fractures can take between three and six months to fully heal. Some fractures can take even longer, especially open or com-minuted fractures. The pain of the injury usually stops before the bone is fully healed so aim to gradually introduce regular activities, especially sports or manual labor. Proper diet and exercise may help in preventing some fractures. 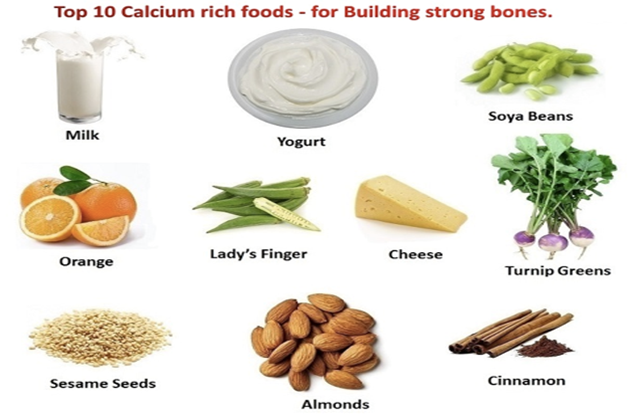 A diet rich in calcium and Vitamin D will promote bone strength. Weight-bearing exercise also helps keep bones strong. A fracture is a break or a crack in a bone. A fracture occurs when force exerted against a bone is stronger than the bone can structurally withstand. The most common sites for bone fractures are the wrist, ankle and hip. Treatment includes immobilizing the bone with a plaster cast, or surgically inserting metal rods or plates to hold the bone pieces together. Some complicated fractures may need surgery and surgical traction. In most cases, your cast will be removed after a few weeks, but you must treat your limb with care for at least the next month or so. Unlike skin, broken bones heal without forming scar tissue. 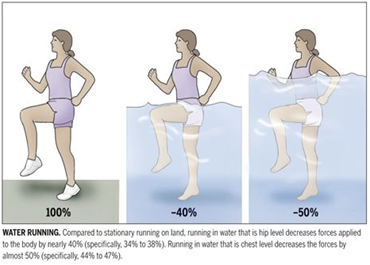 But immobilized muscles tend to weaken and wither. You may need rehabilitation, including strengthening exercises, for a short time. Keep your arm or leg raised on a soft surface, such as a pillow, for as long as possible in the first few days. This will help any swelling to go down and will help the cast dry correctly. Don't get your plaster cast wet. This will weaken it and your bone will no longer be properly supported. Even if the plaster cast makes your skin feel very itchy, don't be tempted to poke anything underneath it. This could cause a nasty sore. The itchiness should settle down after a few days. Eat a diet appropriate for your age, gender and body BMI. 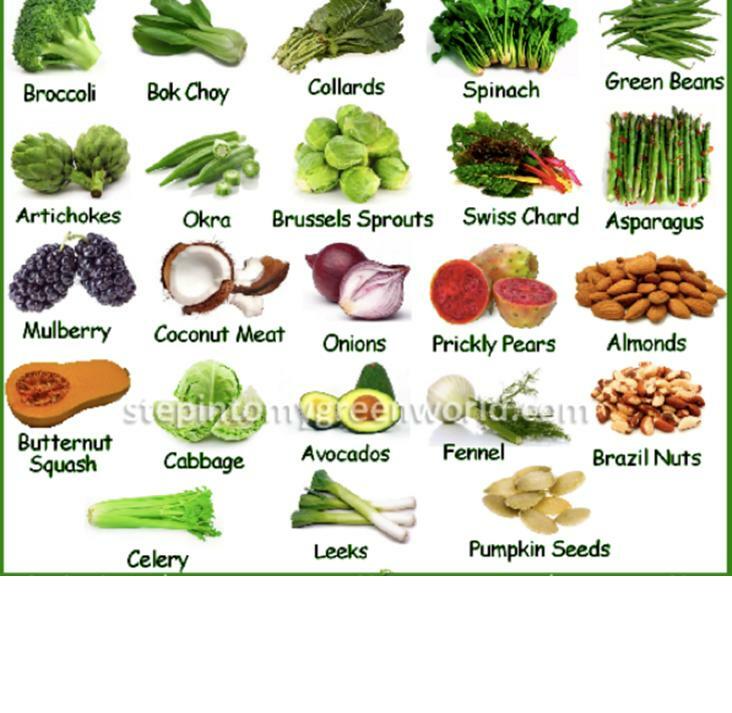 Old patients to take care of existing conditions like diabetes and blood pressure and manage diet better so as to aid faster healing. 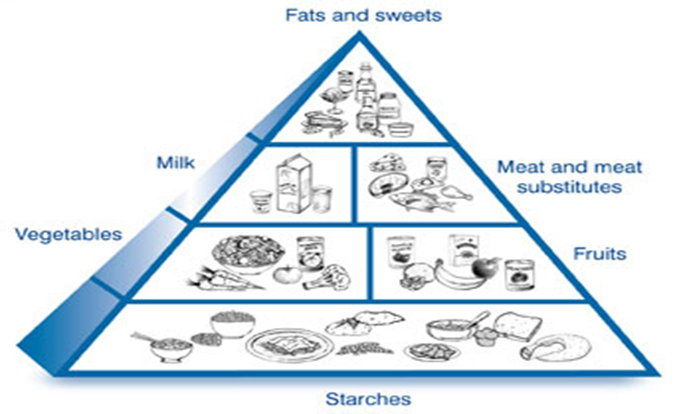 Generally, all food items can be classified into six major groups (3) as shown in the Healthy Food Pyramid. 1.Say NO to all Sugary beverages and foods. Do not add any extra sugar to beverages like tea coffee etc. Especially important when you are diabetic. 3 .Avoid combination of sugary and refined foods like cakes, pies, ice creams as they do the most harm. Especially important when diabetic. 4.Avoid Unhealthy Fats such as Cholesterol, Saturated and Trans Fat. Stay away from egg yolks, cream, butter, ghee, coconut, deep fried items, whole milk, dalda, vanaspati. 6. Curb your Salt intake, as sodium in the salt has to tendency to retain water in the body which can increase blood pressure and add other complications. Do not add salt while cooking and restrict consumption of packaged food.